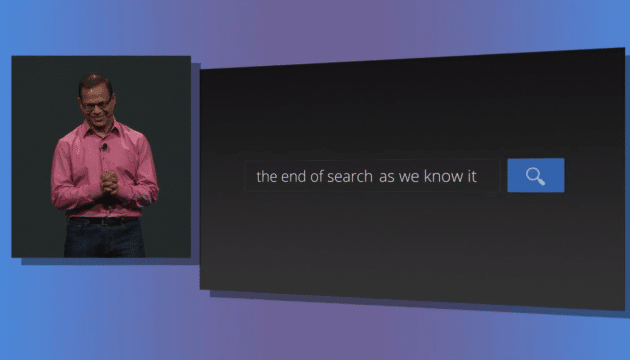 A version of the end of Search is what Google’s Amit Singhal presented at Google I/O. And, while the implications can certainly scare or annoy many, there are just as many that are excited about its implications. But, there are considerably fewer who can begin to fully comprehend the possibilities. Of those few, I can bet most are within Google’s walls. As I have already gotten into a debate about this with some friends, the only end of search in sight is just the form of the verb we choose to assign to the act of search. I’m excited about the possibilities presented in Google’s plans to remove the verb. What I mean is this: we now think of search as going to google.com and entering a question or query. Upon entering that, the results are given and we react from that. What Google presents for their (and subsequently our) future is the action of presenting items that might be of interest due to the knowledge graph of our actions. While Facebook made waves with the Social Graph, Google jumps further with the Knowledge Graph. As we continue to move toward those simple and “free” products that help find, share and purchase, Google is gathering that much more data so that they can dynamically provide information they think we want on an individual basis. That predictive presentation of content is what is both exciting and scary. While I can see the things that are relevant on a Google map or Chrome or some other Google product, the mere fact that it knows so much about me is cause for concern. But, as written in this blog before, we’re collectively moving past the concerns of privacy and on to the embrace of simplicity of information. By best utilizing the available data (that is growing exponentially by the day) there are so many permutations and executions we can only dream of. It is possibly the truest form of crowd-sourcing to determine our next steps in most everything we do. With the right applications and products, automation of mundane actions and events would lead to higher productivity and expanded experiences – if we want that. This all leads us back to the end of search as we know it. If things pop up based on predictions that we might like or be interested in something without our action of looking for it, is that a search? If I am walking from the office to the coffee shop and see a cool object in a store that causes me to walk in the store, does that constitute a search for that object in that store? I feel that the coincidental discovery of a product while doing something else is not a search – something a good friend of mine disagrees with. But, based on my theory, if systems are going to get smarter based on the massive data it receives and start presenting options and items that make sense as my possible next query, without the action of my thinking to ask the question, does that not mean we have reached the end of search?